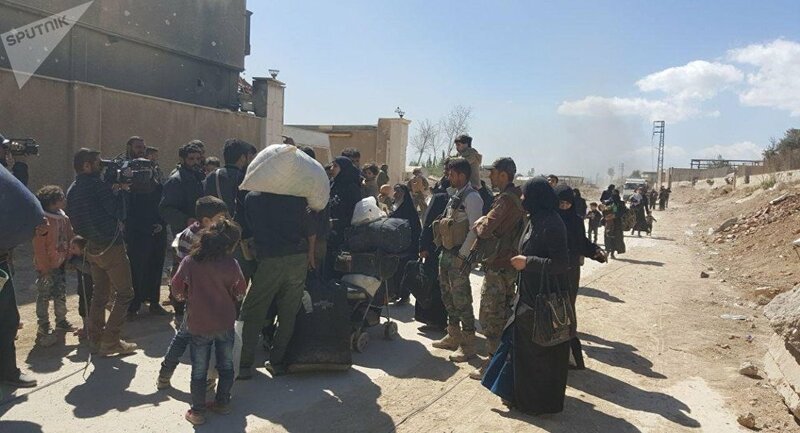 MOSCOW (Sputnik) – More than 1,500 militants and their family members were evacuated from Syria’s Eastern Ghouta through the humanitarian corridor via the Muhayam Al-Wafedin in the past 24 hours, the Russian Defense Ministry said Thursday. "As many as 1,521 militants and their family members were evacuated through the humanitarian corridor via the Muhayam Al-Wafedin in the past 24 hours," the statement read. According to the statement, 1166,644 people were evacuated from Eastern Ghouta since the humanitarian corridor began its work. The Russian military police began its work in the Syrian city of Duma on Thursday, the Russian Defense Ministry said. "As of today, divisions of military police of the Russian armed forces are working in the city of Duma. They are a guarantor of law enforcement in the city," the statement read. The situation in Eastern Ghouta has been tense over the past months, resulting in constant shelling by militants of Damascus and fire from the Syrian pro-government forces. The Syrian government says it fires in response to shelling from Eastern Ghouta, but Western countries are accusing the Syrian government and Russia of being responsible for the intensification of tensions in the area. On February 24, the UN Security Council unanimously adopted Resolution 2401 that urges all parties to the conflict in Syria to immediately stop fighting and adhere to a humanitarian pause across the whole of Syria.